• Categorized under internet,Technology | Bluehost vs GoDaddy: Who’s the better host? Arguably, Bluehost and GoDaddy are both highly popular web hosting providers. They have been in the hosting arenas for a long time now, and they have both managed to establish a track record that most other hosts envy. An immaculate reputation of reliable services precedes both these names and that’s exactly why, a new user might find it difficult to tell who the better host among these two hosting giants is. When we talk about web hosting, excluding most of the advanced and shared features, much of the discussion revolves around WordPress hosting. Hence, keeping this idea in mind, WordPress hosting features of both Bluehost and GoDaddy will be briefly discussed and compared in this article. If you are a novice website developer, designer or an amateur who just wants to see what the fuss around WordPress is all about, there couldn’t be a better hosting partner for you than Bluehost. With a quick glance at hosting features of major hosts, you would notice that WordPress installation has been reduced to just a matter of few clicks. Bluehost, however, has made even easier with their exclusive partnership with WordPress that allows users to install WordPress in less than two minutes. 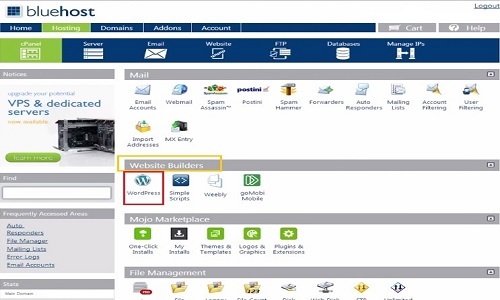 Creating a Bluehost account is mandatory before you can use any of its features. The signup procedure is pretty straightforward and shouldn’t take more than a few minutes. When you get your account verified, you need to log in again and find the Website Builder Dialog Box that’s highlighted in yellow in the screenshot shown above. The WordPress option in this box is what we will be needing going forward. If yours is a freshly registered domain, you can simply click on ‘Start’ to install WordPress on your listed domain. If there’s a previous website structure present at the listed domain, you will have to get it backed up, as installing WordPress will conflict with the pre-existent website. Tip – Back up your login credentials safely to avoid getting locked out of your own website. Reasonable pricing plans that start at $6.99 per month ($3.49 with coupons and discount). Up to five custom email domains and Google AdWords credits worth $200 are offered as bonuses upon first successful installation of WordPress. Attractive affiliate programs can help you earn passive income. 2014 and first two quarters of 2015 showed a spike in the downtime. For starter plans, server space allotted is very small and can result into page load lags. GoDaddy is one of the most popular web hosting and domain services providers in the world. Operating out of Scottsdale, Arizona, GoDaddy is estimated to host over 20 million websites and over 60 million domain names. If you wish to install WordPress on your newly bought domain, GoDaddy makes it all too easy for you. 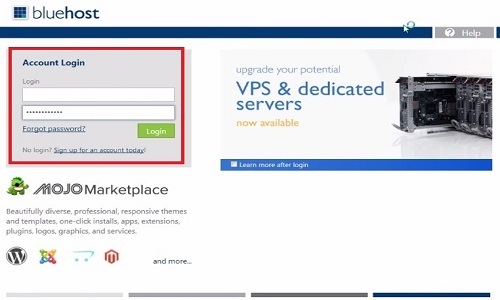 Here’s a step by step guide to installing WordPress using GoDaddy’s hosting services. This is essentially a two-step process. It is assumed here that you have created a GoDaddy account and paid for an appropriate hosting package and domain name(s). Once you log into your GoDaddy Account, you have to navigate to the ‘Account Setup’ tab and select the domain that you want to install WordPress on (it should be there in the dropdown menu). 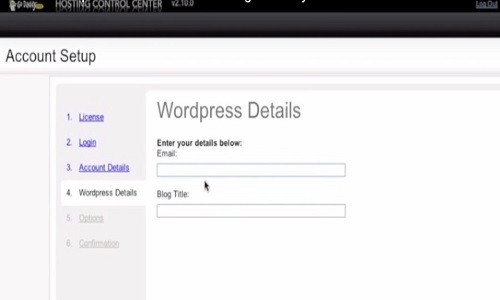 Once you are through formalities of account setup, a WordPress authorization tab will appear as shown above. 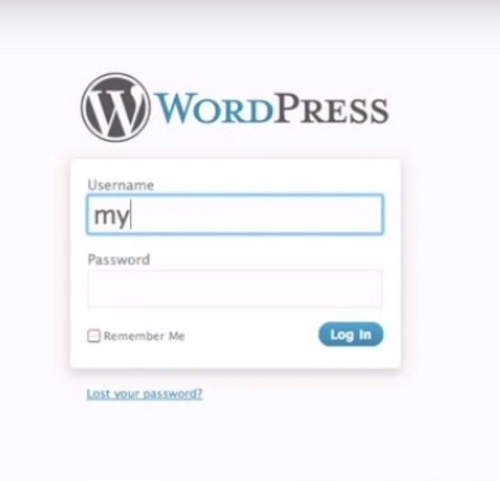 The email address you provide here will be the one that WordPress will send login credentials to. So, make sure you enter it correctly. Just click ‘Next’ and go through the remaining authorization commands and that’s about it. Easy as you like! 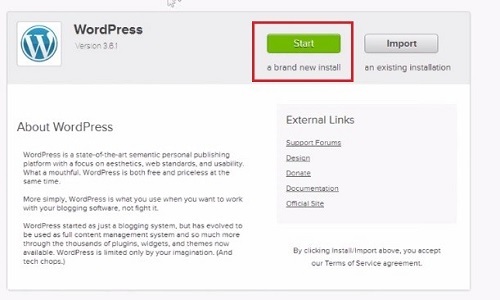 Easy to install WordPress features. Unique partnership with Google Apps. Unlimited disk space not available. Let’s try to pit these two hosts against each other. One year starter plan $6.99 p.m. $4.99 p.m.
Freebies Google AdWords credits worth $200 Google AdWords credits worth $100, Bing Adverts credits worth $50 and Facebook Ads credits worth $50. If you are just starting out with your website, GoDaddy will be the better option of the two as it offers extremely easy account management and WordPress services. The freebies offered by them aren’t half bad, either. On the other hand, if you are running a website for monetization purposes, Bluehost can be a better partner as it offers robust functionality and easy scale-up features, should you need them in the future. Price-wise, there’s not much to separate these two. de. "Bluehost vs GoDaddy: Who’s the better host?." DifferenceBetween.net. November 9, 2015 < http://www.differencebetween.net/technology/bluehost-vs-godaddy-whos-the-better-host/ >. Awesome article, really a great comparison. I have used both host and my experience was totally relatable to this article. However, Blueshost has dropped their standard from before but you can use it during initial time. programs and shows you how to get access to FREE affiliate training.